Spinners, when present, normally take on two very different postures in the mating process. In a spinner fall you will most likely first notice the more colorful males fluttering above the stream searching for the more transparent females. Upon mating the female deposits her eggs on the water and then usually collapses and dies, lying spent on the water. This is where you will see the concentration of female spinners as spent, transparent insects floating by at the mercy of the water. Since it is more often the females that are being imitated you will find many recipes trying to imitate the transparent wings via different materials. Most often you will see the wings made of synthetic materials like Polypro, Antron or Z-lon yarn. These materials help imitate the air bubbles that gather under the splayed, spent wings of the natural. For a more traditional tie spinner wings can be imitated with hen hackle tips. Finally there is the Compara-Spinner that uses a wound hackle color that is trimmed top and bottom to create the spent wing effect. Many mayfly spinners look alike with split trails, long slender bodies and splayed spent wings resulting in pattern recipes that also look alike. There are four basic body colors that can be used to represent a wide range of mayfly species. The four body colors are; cream, olive, yellow-brown and brown leaving only black to imitate Tricos. 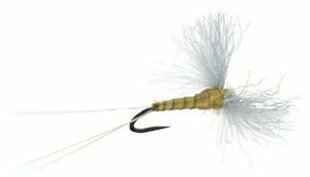 Sulfur Spinner Pattern Recipe: Hook- TMC900BL, Thread- Yellow 6/0, Wing- Light grey Polywing material, Tail- Light Dun Hackle fibers , Body- Cream Orange Poly dubbing.